I am the youngest of four children, and we were raised Catholic in El Monte, a town in Southern California. 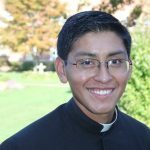 In 2009, when I was twelve, I joined Immaculate Conception Apostolic School in Northern California, one of the high school seminaries run by the Legionaries of Christ. After it closed in 2011, I joined Sacred Heart Apostolic School in Rolling Prairie, Indiana where I spent four years more. After graduating, I entered the Novitiate of the Legionaries of Christ in Cheshire, Connecticut where I spent two years discerning and preparing for religious profession of the evangelical counsels of poverty, chastity, and obedience. I officially became a Legionary of Christ on September 2, 2017 after making my professions. I am currently studying Humanities in my third year of formation for the priesthood, which includes the two years of Novitiate.